Your 3-in-1 Grand Canyon tour begins with pickup from your Las Vegas hotel in the morning or afternoon. 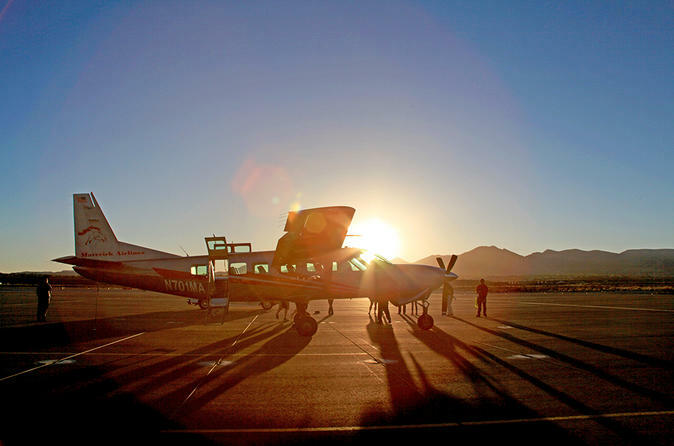 After a luxury coach ride to the airport, you'll take a 30-minute flight by comfortable fixed-wing airplane to the Grand Canyon West Rim, offering great aerial views of Boulder City, Lake Mead and Hoover Dam along the way. When you land, hop aboard a state-of-the-art helicopter for an exhilarating flight to the basin of the canyon! Descending 4,000 feet (1,220 meters) to the Grand Canyon floor, your adventure continues with an exclusive landing on a private bluff. From this unique vantage point, you'll enjoy amazing views of the steep, staggering canyon walls rising skyward as your pilot teaches you about these magnificent rock formations. Re-board your helicopter and ascend back up to the canyon rim, where an air-conditioned coach will be waiting to take you to Eagle Point for incredible photo opportunities. While there visit Hualapai Village to learn about the history and culture of the Hualapai Indians. Arriving at Guano Point, you'll be treated to a meal overlooking the breathtaking canyon. At the end of the day, relax on your plane ride back to Vegas. Skywalk Upgrade: Make your Grand Canyon experience complete with admission to the Skywalk, a glass bridge suspended 4,000 feet (1,220 meters) above the canyon floor. Admire jaw-dropping 360-degree views of the vast canyon from this unparalleled vantage point. Buy your ticket ahead of time with this upgrade option to avoid long lines. Special Offer - Book with us and save 9% compared to another travel site! - Book Now!